When The Disney Channel launched in 1983, the channel premiered several original programs, like Welcome to Pooh Corner and You and Me, Kid. 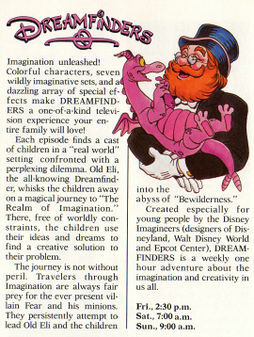 Those shows were aired on the channel for years, but there was one original show that was announced for the channel's launch but never produced called Dreamfinders. The show is based on the former EPCOT Center (now called Epcot) attraction, "Journey Into Imagination", which turned to "Journey Into Your Imagination" in 1999, and is now currently "Journey Into Imagination with Figment". The show, as The Disney Channel Magazine described it, was about a group of children in a "real world" setting, as they are in some kind of problem. 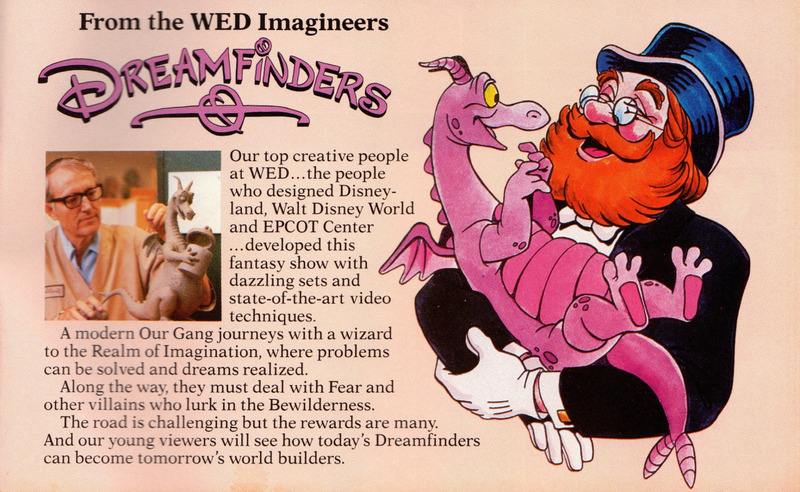 Dreamfinder (or as the show called him, Old Eli) would take the kids to "The Realm of Imagination", where they use their ideas to find a creative solution. However, Fear, the show's villain, along with his minions, would attempt to take the children and Eli into the abyss of "Bewilderedness". The show was to be an hour long and was scheduled to air on the weekend. Even though the show was never produced, it was represented by a short appearance of Old Eli during the Disney Channel's launch countdown on April 18, 1983. The series started to have a ramp-up in people joining the search for it on December 12, 2016, when Lost Media Wiki user "ccateni" made a thread trying to get people to "help" him find the series. On December 16, 2016, LMW user "theraincrafter" managed to contact a scriptwriter of the TV show and obtain a script of an episode called "Just in Time". He then posted a download to the script along with emails sent to the scriptwriter of the show on the original forum for the search of Dreamfinders. It confirms many of the rumors of the show while also giving an accurate depiction of how the show would appear on TV. 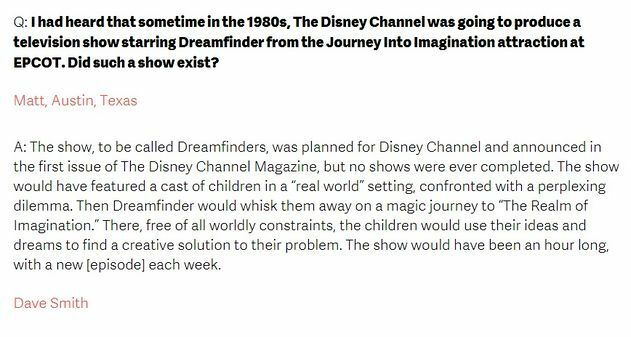 Disney's archives on their official fan club website, D23, contains information about Dreamfinders, coming straight from their Chief Archivist Emeritus, Dave Smith. The description of the show given was the same as the description in the advertisements. However, Smith goes on to state that "no shows were ever completed". Another advertisement of the show. Screenshot of "Ask Dave" question concerning the status of Dreamfinders. Dreamfinder/Old Eli appears at 1:23.